One common difficulty in lake management is controlling algae, which can become problematic in summer months in both small ponds and larger lakes. Algae and other aquatic plants provide food and oxygen for fish and other aquatic life. However, excess algae in a pond can interfere with fishing or swimming, and cause aesthetic problems such as mats of algae on the water surface and unpleasant odors. While algae produce oxygen during the day through photosynthesis, oxygen production ceases at night. Because algae continue to use oxygen at night, however, large populations of algae in a pond can deplete the oxygen supply in the water overnight, causing a low-oxygen condition that can be harmful or even fatal to fish and other aquatic life. Compounding this problem is that when large populations of algae die, their decay can further deplete the water's oxygen. The use of barley straw for controlling algae in ponds is becoming more common. Its use dates from England in the 1990's, where studies found it to be effective for this purpose. Since then its use has spread throughout the United States both by pond owners looking for easy and effective ways to combat algae, and by scientists trying to assess how effective it is. Other types of straw, such as wheat or rye, have not been shown to be effective for this purpose. Barley straw is effective in controlling only algae. It is not effective against higher plants, or vascular plants, such as duckweed, watermilfoil, or pondweed. Algae come in many different shapes. One common form is called planktic, which are single cells that float in the water column and give the water a soupy-green appearance when abundant. Another form is filamentous, which grows in hair-like strands, often forming mats at the water surface. Some algae form relatively complex shapes that may appear to be higher plants, but in no case do algae have specialized tissues such as leaf veins or roots. How Does Barley Straw Work? Barley straw prevents the growth of algae. It does not kill existing algae. Because of this action, it is sometimes called an algistat as opposed to an algicide. It is not understood how barley straw prevents the growth of algae. It is believed that the decaying straw releases chemicals that inhibit the growth of algae. There are some suggestions as to what these chemicals may be, but the exact mechanism has not been determined. Other theories suggest that the decaying straw feeds microbes or algae predators. How Effective Is Barley Straw? There is some very positive anecdotal and research-based evidence that barley straw is effective in controlling at least some kinds of algae, but results are mixed as to which kinds are controlled. In general, research and anecdotal evidence suggest that barley straw is effective in controlling planktic algae, and will clarify water that is green from algae. But results are mixed about its control of filamentous algae, mat-forming algae, and blue-green algae1 while some trials report positive results for these types of algae, others do not. One such trial at a commercial nursery in southern New Jersey found that barley straw used at the recommended rate did not impede the growth of filamentous algae in a ¼-acre farm pond. However, another trial at a Rutgers University Research and Extension Farm found that using barley straw reduced, but did not eliminate, filamentous algae in an irrigation pond. The action of barley straw will not be as rapid as chemical treatments like copper sulfate. Using barley straw in ponds is not known to cause harm to people or to any higher plants or animals. However, one reported problem is that by reducing the population of algae, using barley straw may allow for the increase of other pond weeds. Where Can Barley Straw Be Purchased? Barley straw can be purchased in full-size square bales from farm-supply or feed stores. This is usually the most economical approach, especially when purchasing quantities sufficient to treat larger ponds. The availability of bales in farm stores may be seasonal or depend upon location, however. Full bales can also be ordered from retailers online, though the cost is typically considerably more than from a local farm store. Contacting someone who works with the farm community—such as the county Cooperative Extension office—may be helpful to locate retailers where barley straw bales can be purchased locally. There are also a variety of barley straw products available for use in smaller ponds, including miniature bales, pellets, and liquid extracts. While the cost of straw in small quantities is typically considerably more per pound than when purchased in full bales, these products may be appropriate to use in small ponds such as koi ponds and water gardens. These products can often be purchased from pond-supply stores, garden centers, and from a variety of online retailers. Only dry straw should be used. Fresh material should be avoided. The usual recommended quantity to use is 225 pounds (or 4–5 bales) per surface acre of water. Reported recommended rates range from as low as 110 pounds per acre, and higher rates are recommended for water that has a high percentage of suspended sediment or appears muddy. But it has been recommended that a rate of 450 pounds per acre never be exceeded to avoid the decaying straw from depleting the water of oxygen. A typical recommended rate for small ponds is 1 pound of straw per 2000 gallons of water, though manufacturers of packaged barley straw products vary on their recommended rates. The bales need to be broken up and fluffed so that there will be a good flow of oxygenated water around the decaying straw in the pond. It is recommended that the loose straw be placed in woven sacks such as onion sacks, bird netting, Christmas tree netting, or jute netting. The sacks should be tied to something buoyant so that they stay within a few feet of the pond surface, and can be anchored in place. Securing the sacks in this manner will allow for easier retrieval when it is time to remove them. The sacks should be evenly spaced across the pond if practical, or placed in the center of small ponds. It is generally recommended that the straw be placed in ponds in the spring, before the algae begins to grow. The appropriate date will depend upon local weather conditions, the temperature of the water, and when algae typically begin to grow in the specific pond. For the barley straw to have an effect, the water will need to warm enough to begin the decay of the straw. However, because there may be a lag of several weeks for the decay process to develop, deploying the straw early is recommended. Appropriate dates may range from April to as early as February depending on location, local weather, and water conditions. The straw is generally said to be effective for four to six months. If straw is placed out in April, it may then be wise to replace it in mid-July to obtain season-long control. Barley is not considered a pesticide by the U.S. Environmental Protection Agency or by the state of New Jersey. This allows it to be used in ponds without a permit or license. For a private land owner, it is considered a home remedy, not a pesticide, though there may also be limitations on its use in public or shared lakes. 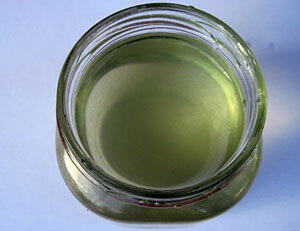 A second implication, however, is that it cannot be sold with the claim that it controls algae. 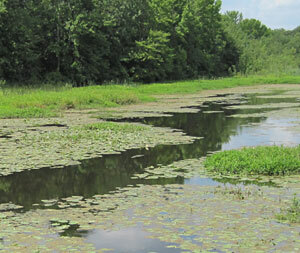 Likewise commercial applicators or lake managers would not be allowed to use it with the claim that it controls algae. Readers in other states should consult state and local laws and regulations regarding barley straw use. 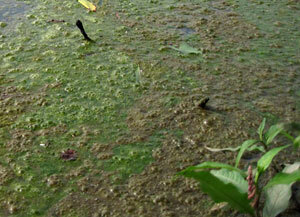 Registered herbicides are available for the control of algae and weeds in ponds. However, herbicide applications to water bodies in New Jersey can be done only by someone possessing a pesticide applicators license. Furthermore, an Aquatic Pesticide Permit must be obtained from the New Jersey Department of Environmental Protection (NJDEP, 2010). These stipulations—among other considerations—may make registered herbicide applications an unattractive option for homeowners and some businesses. Copper products for algae control are also considered herbicides by the state. More information about these and other strategies can be found in Obropta and Althouse (2008) and Ochterski and Schneider (2003). Greenfield, B.K., N. David, J. Hunt, M. Wittmann, and G. Siemering. 2004. Review of Alternative Aquatic Pest Control Methods For California Waters. Oakland, CA: San Francisco Estuary Institute. sfei.org/documents/review-alternative-aquatic-pest-control-methods-california-waters. Fornshell, G. No date. Barley Straw for Algae Control. Moscow, ID: University of Idaho Extension. Hayes, P., S. Geiger, and K. Haggard. 2005. Barley straw for algae control – Phase II. Corvalis, OR: Agricultural Research Foundation. Lembi, C.A. 2002. Aquatic Plant Management: Barley Straw for Algae Control. West Lafayette, IN: Purdue University Cooperative Extension. Lynch, W.E. 2002. Algae Control with Barley Straw. Columbus, OH: Ohio State University Extension. ohioline.osu.edu/a-fact/pdf/0012.pdf. (NJDEP) New Jersey Department of Environmental Protection. 2010. "Aquatic Pesticide Permit and Instructions." www.state.nj.us/dep//enforcement/pcp/bpo-aqpermit.htm. Obropta, C.C. and E. Althouse. 2008. Pond and Lake Management Part I: Dealing with Aquatic Plants & Algal Blooms, FS1076. New Brunswick, NJ: Rutgers Cooperative Extension. njaes.rutgers.edu/pubs/publication.php?pid=FS1076. Ochterski, J. and R. Schneider. 2003. How to prevent and control algae in farm ponds. Ithaca, NY: Cornell Cooperative Extension. scnyat.cce.cornell.edu/woodpond/algae.htm. 1 Blue-green algae are not true algae, but are instead classified with bacteria.